Over or Under is a new, modern and unique game that is getting very popular these days. 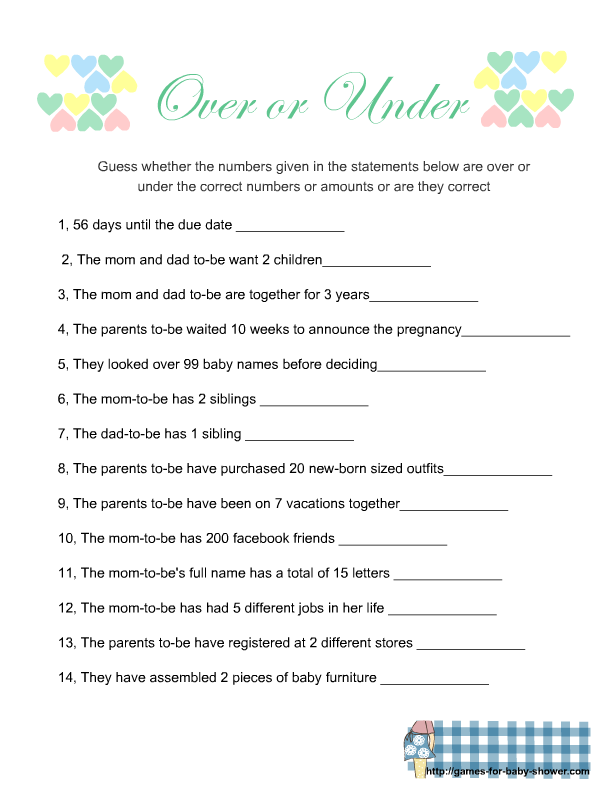 I have made Free Printable Over or Under Baby Shower Game in 3 different colors. You can print this game in blue color for your boy baby shower, in pink for your girl baby shower and also in gender-neutral mint color if parents-to-be do not know or do not want to reveal the gender of the baby. How to Play: Print these game cards and distribute among your baby shower party guests along with a pen or pencil. There are 14 different statements with numbers are given on these game cards. The guests should guess whether the number given in these statements is correct, over or under the real number or amounts. There is a blank space given against each statement where the guests can write their answers. You should also give one game card to the mom-to-be so she would fill it up with the correct answers. 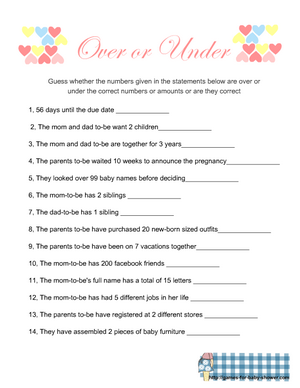 The player whose answers match to those of mom-to-be will be the winner. This is a fun game for any baby shower party. If you want to get this game in pink color then click on the thumbnail of the game given above, a bigger image will open up, you can right click and save that. This beautiful game card is decorated with beautiful hearts of different colors. This design will not consume much of the ink from the printer yet it is very chic and beautiful. 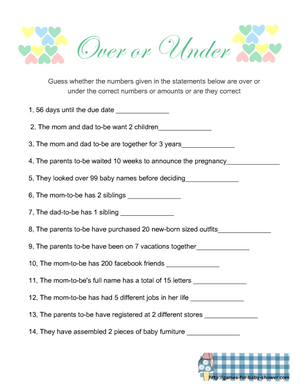 Click on the image given above to get the bigger version of this mint Over or Under baby shower game card. This cute game is gender-neutral and you can print this game if it matches the theme of your baby shower party more. This is another free printable card for this Over or Under baby shower game in blue color. This game card is decorated with blue, yellow and pink hearts. Just click on this thumbnail image and then right click and save the bigger image.